There are many wonderful things to see at the Space Coast Birding and Wildlife Festival, but the Florida Scrub-Jay is as close to a “must see bird” as you’re likely to find down here. Fortunately for attendees, there are around 60 family groups of the charismatic and affable birds scattered throughout the Brevard County area, and many of the field trips at the festival run across them at various times. 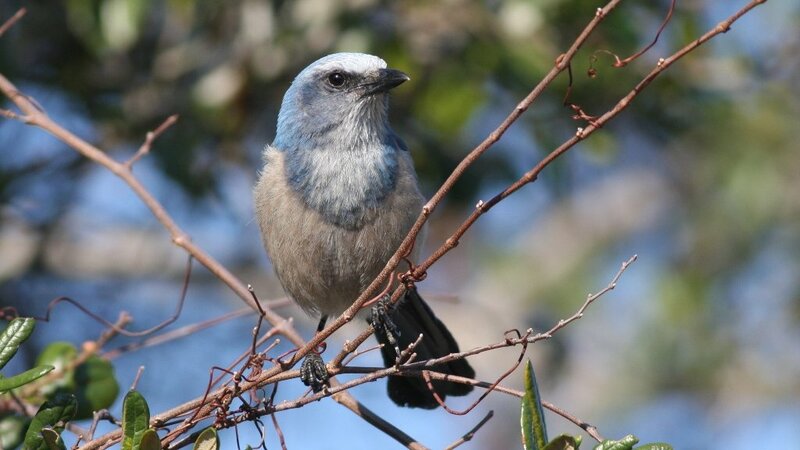 And sure, it’s really great to see the Scrub Jays at the pay station at Cape Canaveral or the Scrub Jay trail at Merritt Island, but if you want to really experience the Scrub Jays, you have to travel down the road to Rockledge and visit Cruickshank Sanctuary. Florida Scrub-Jays have extraordinarily specific habitat requirements, or at least it seems that way now. Prior to the development boom in the state, the upland scrub favored by the birds stretched unbroken across much of the state. So so many of that land has been sold to developers, and what is left is often managed poorly. Left to its own devices, the scrub grows thick with pine and oak trees. 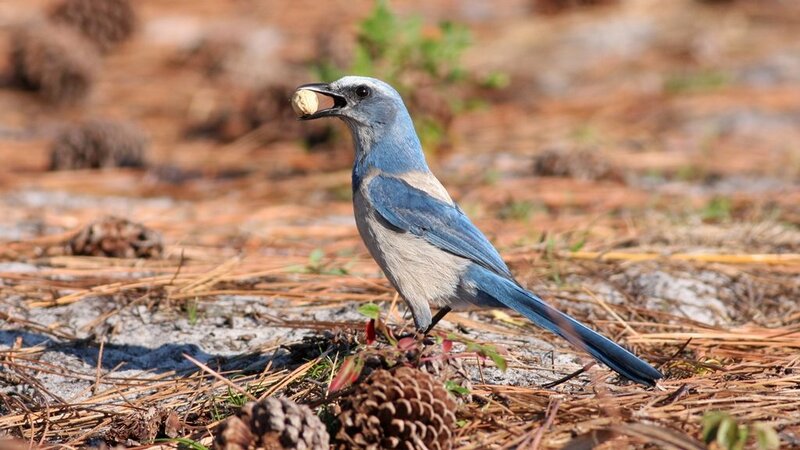 To make truly fine Scrub-Jay habitat, such as what you find at Cruickshank, the area needs to be burned regularly, and years of fire suppression have done as much to limit the jays to small pockets of suitable habitat as the subdivisions and strip malls that litter Florida’s east coast. Cruickshank is maintained thanks to the work of a devoted few, and the jays respond to them as eagerly as they do to the plot itself. But honestly, part of that is a peanuts. The general public is no longer allowed to bring peanuts for the jays, for reasons that should be fairly obvious, but despite that the birds still associate humans with the possibility of food. And it wasn’t long after we arrived and started moving down the trail that we had a small flock of Scrub-Jays following us keeping a close eye on pockets and bags. When the peanuts actually do come out , as the caretakers of Cruickshank are, in fact, allowed to feed the birds to show them off to visitors, the call goes up and before long you are surrounded by a dozen or so jays chasing after peanuts scattered on the ground. That’s all well and good, but it’s what happens next that seems to stick in people’s memories. These jays have absolutely no fear. Hold a peanut in your hand and they’ll think nothing of flying over and taking it. But many are not satisfied with waiting. 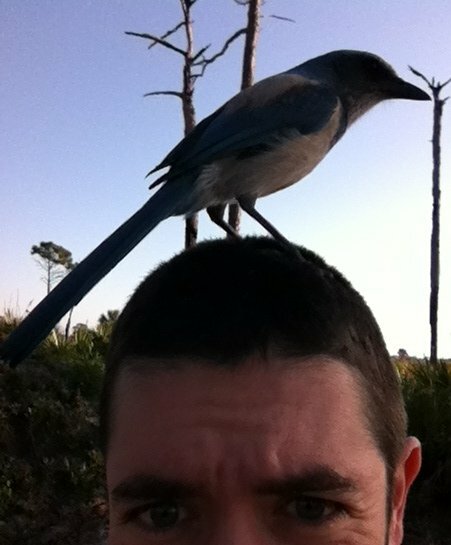 It is around this point that you often find yourself with a Scrub-Jay on your head. As I did. What’s perhaps most interesting about the above photo is that while I was taking the picture with my cell phone’s camera, another Scrub-Jay was sitting on the camera. Not to mention the many birds sitting on the heads of those birders surrounding me. Loved your post and photos! Very sad about such intensive loss of habitat, however. I lived in California for many years, feeding peanuts to a pair of Scrub Jays who brought their baby to meet us each year before kicking him out of their territory. One year it was twins. Scrub Jays have the most personality of any birds I’ve ever known. Yup, I had the same experience as Wendy growing up…one of the jays would even come into our kitchen once in a while…who knows, maybe that had something to do with how I turned into a birder. Fire dependent species are big losers in a modern world.